i got my enchiladas with the seitan and was happy with my choice. 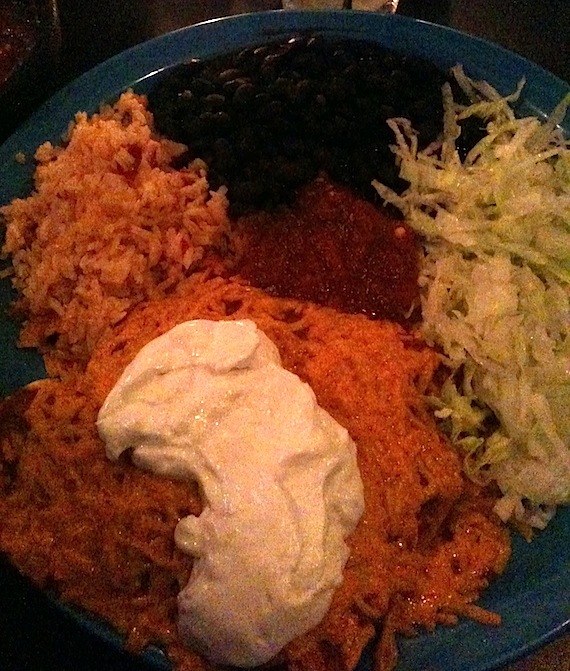 the plate of three enchiladas also came with a side of black beans and rice which i smothered with their delicious salsa and gobbled up. my only complaint about my food was the typical overuse of daiya. nbd, i picked a bunch off and pushed it off to the corner of my plate. on my last check of their online menu i didn’t see the enchiladas offered but i swear i ate them. i don’t remember the exact cost but i think it was around $10. and, like any decent mexican restaurant they make a fine margarita. the staff was super friendly and even pretend not to notice that we came into the restaurant with all of our luggage! if you’re in the area it’s definitely worth checking out. for more patricia (the author of this post) check her on the twitters and hit up her yoga website! What is up with places putting WAY too much Daiya on everything. It’s an epidemic. I blame Quarrygirl! Looks good to me…I really like veganized Mexican dishes in general. My favourite are vegan nachos but enchiladas come in a close second.